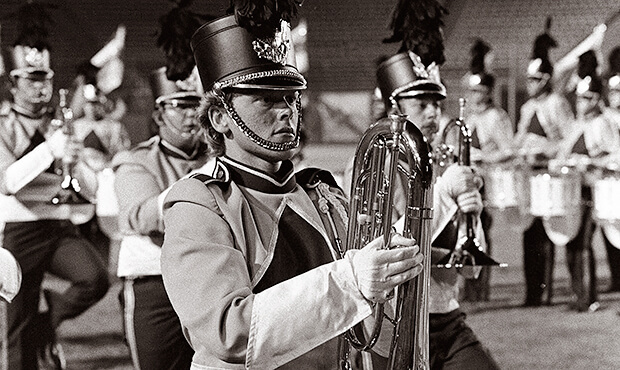 In 1978, while Santa Clara Vanguard was gearing up to finish the season with a 0.10 victory over Phantom Regiment and stopping Blue Devils from earning DCI's first three-peat, as the Madison Scouts was playing "Malague?±a" for the first of five times in the DCI era and the Bridgemen were bouncing back from a tumultuous end to the previous season, a second-year corps from the deep South was turning heads and pinning back ears with a horn line volume unlike any that had been previously witnessed. The year before 1978, Spirit of Atlanta had hit the scene as a brand new corps with a show that was all over the stylistic map—from opening with a Dvorak overture to closing with an R&B funk hit. Founded as the first corporate-sponsored corps (by television station WXIA, which fulfilled the sponsorship through the corps' first four seasons), Spirit had great potential—If only the right combination of arrangers and instructors could be found. For its second season, Spirit brought in future Hall of Fame member Jim Ott to write for and instruct the horn line, straight off his involvement with Blue Devils that helped lead the corps to its first two DCI World Championships the previous years. Jim was joined by another future Hall of Fame member Tom Float, who was brought in to write for and instruct the drum line. That collaboration of those two titans working with fairly new talent resulted in the horn line coming within 0.10 of winning the High Brass trophy in 1978, an award that is now named in Jim's memory. With the 1978 program, Ott and Float helped the corps create the southern identity for which it became widely known, and propelled the corps into sixth place. Being that we didn't have the luxury of Internet drum corps chat boards in 1978, when the corps rolled into a town for a contest in the early part of the season, many fans had no idea what to expect. Word had trickled out that Spirit's horn line was outstanding, but still, it was difficult to imagine them being brilliantly spectacular. 1978 Spirit of Atlanta performance excerpt. Discount DVD offer ends Monday, May 14 at 8:30 a.m. ET.